We present a novel approach that allows real-time simulation of human vision through eyeglasses. Our system supports glasses that are composed of a combination of spheric, toric and in particular of free-form surfaces. In order to obtain eye accommodation we perform wavefront tracing on the GPU. 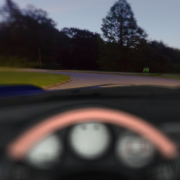 Defocus is achieved either by progressive distributed ray tracing of the eye lens (accurate) or by approximate blurring according to the obtained wavefront parameters. While the first variant is best suited guiding lens manufacturers during the design process of lenses, we consider the second approach ideal for giving customers a real-time impression of customized virtual spectacles in eye shops. Additionally, we visualize refractive power and effective astigmatism of incident wavefronts. That allows quality assessment of special purpose lenses such as reading or sport glasses in particular scene environments.